It's been quite a weekend for Major League Soccer. 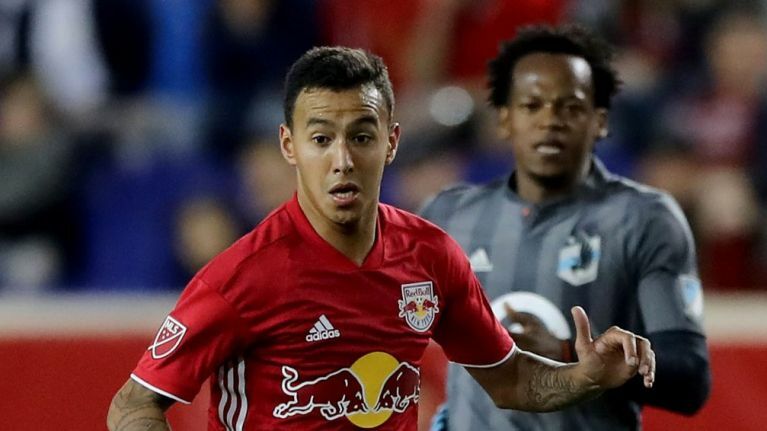 While New York City FC's goalkeeper was responsible for an own goal for the ages away at Minnesota on Saturday, New York's other side - the Red Bulls - had one of their own men sent off in bizarre circumstances in the final seconds of their game against Sporting Kansas City on Sunday. The score 2-2 as the Red Bulls looked to counter-attack in stoppage time, the ball was knocked into touch by one of the Kansas players. Annoyed at either a refereeing decision or his teammates' failure to play the ball to him quickly, Alejandro Romero 'Kaku' Gamarra can be seen smashing the ball into the crowd in anger in the footage below, striking a fan. The Paraguayan will likely face a hefty fine for the incident and possibly an extended suspension. After full-time, several of Red Bulls' players were seen checking on the supporter who was hit by the ball. The footage was shared by the club's official Twitter account. Kaku also sent a tweet shortly after the game in which he apologised to supporters of both clubs involved, MLS and his teammates.